Can a family vacation be environmentally friendly? Sometimes it feels like ecotourism and family vacations, or life with children, in general, I dare say, are at the two opposite ends of the sustainability spectrum. The convenience of all inclusive resorts, the fun kids have at dolphinarium and animal parks, even just the amount of stuff we consume and buy for the kids is often a real blow to the environment: nappies, plastic cups, plastic toys are handy and fun, but at the end of their short lifecycle they end up in landfills and our convenience becomes a huge environmental price our planet pays. But fear not: in this post, I am not going to tell you to get rid of all your plastic gear and start hand making environmentally friendly nappies (if you can, please do! But I didn’t, so it would be totally hypocritical of me). What I do want to achieve with this post is to show that when it comes to going on a family vacation, it is possible and even easy to embrace ecotourism and have a holiday that is at the same time fun, comfortable and kind to the environment. I have already shared some of my tips for family ecotourism, so this time I reached out to some amazing family travel bloggers and asked them to tell me about their green family vacation experiences. They came back with great stories and suggestions for including ecotourism in your family vacation. Do you love resorts and think they cannot be eco-friendly? Jennifer from Kidfriendly Europe 101 proves this point wrong reporting back from an eco-resort in Croatia. Ever imagined living (temporarily) in a Polynesian hut? 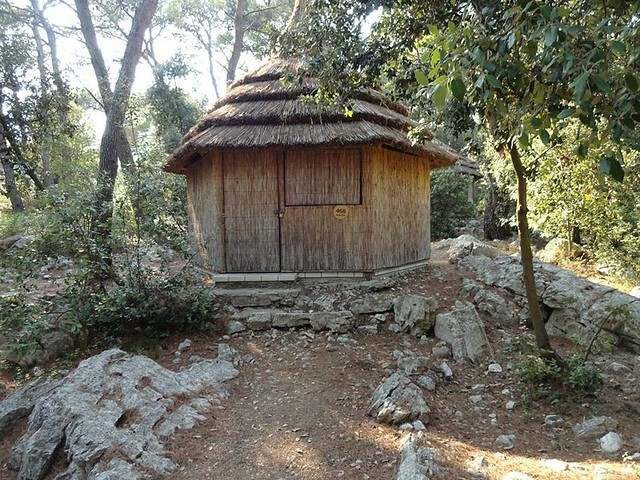 We did JUST that while staying at Pine Beach Eco Resort in Pakostane, Croatia. No running water. No “running” electricity. This trip, with my three children, was pure bliss and it certainly was relaxing (kinda… but mostly). Relishing the crisp Croatian breeze and sizzling hot sun while basking on the sandy beach and chasing my children as if they were headless chickens. They weren’t headless obviously… just full of life and energy that certainly should be bottled and sold. This trip was certainly memorable not only to me but my children as well because they talk about it ALL. The. Time. Click HERE, if you are interested in reading more. In Dubai, we can enjoy only beaches and desert. When my son was 1.5 years old, we decided to go for vacation in Bali to show him forests, mountains, lakes and greenery. Naturally we skipped famous beaches of Bali headed for the cultural Ubud. Visited artisan villages around and the widest Jatiluwih rice terraces, listed in UNESCO world heritage site for its water management system. Bali Safari was a great experience, the animals are kept in natural habitat and looked after properly. My son could see and touch many animals for the first time in reality like orangutans, elephants, lions etc. Shopping like locals for spices and vanilla from farmer’s market in Tabanan was one memorable experience. The highlight of our trip was relaxing stay in Sarinbuana Eco-lodge located remotely in the rainforest of Mount Batukaru. The resort truly captured the essence of eco-tourism by following sustainable practices. To name few, they recycle waste water, use it for irrigation to grow their own food. All organic waste is composted on site creating a natural fertilizer. The beautiful rustic cottages and furniture are made of local timber. A fishpond to keep control of the insects. Showing my son vegetables, fruits in their edible garden was great fun. This was heaven for spotting birds, plants and insects. My son particularly enjoyed spotting butterflies, snails, spiders and bees. 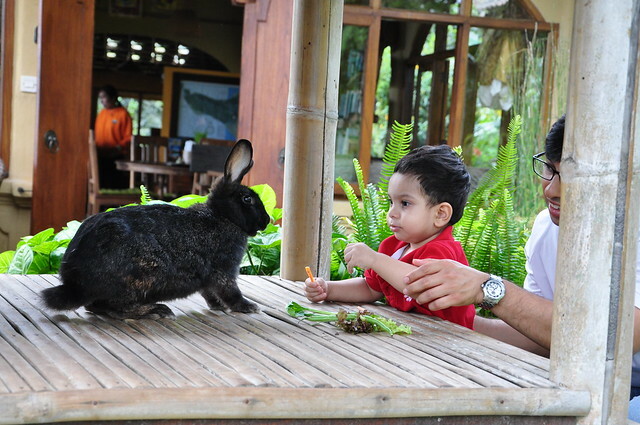 Feeding the sheltered rabbit in the resort was his favorite activity. We went on a short natural trail, down the valley to the rivulet and picked exotic local fruits from the tree on the way back. We had never stayed this close to Nature in the tropical rainforest before, the days were crisp with fresh mountain air, the nights were calm, yet loud with all the natural sounds. Nestled deep in the Australian countryside there is a hidden gem. 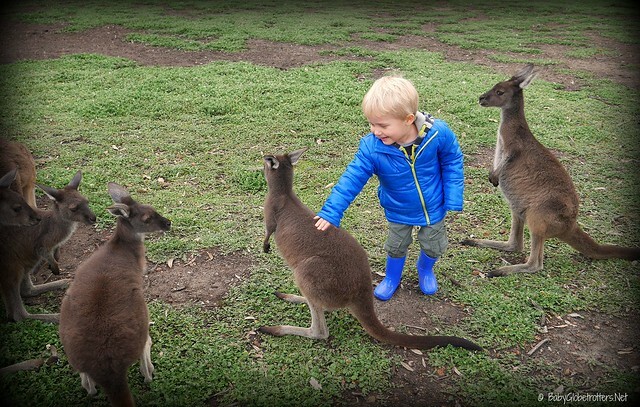 Completely off the normal tourist path but one of our annual family travel highlights is the Uralla Wildlife Sanctuary. Near the tiny town of Perillup, Western Australia, over 150 rescued native Australian animals call Uralla home. Their most common residents are Western Grey Kangaroos but there are also dingoes, kookaburras and a random assortment of visitors. Originally set up by local couple John & Mandy English in 2000, they are reliant on a volunteer workforce and donations to keep the sanctuary running; in fact, they get volunteers from all over the world who jump at the chance to live so close to their young charges. Most commonly orphaned joeys are brought to the sanctuary to recover from any injuries then be hand reared. A joey’s feeding schedule is much like an infant human so a huge amount of one-on-one love, cuddles and feeding is needed around the clock. In Europe, Ruth from Exploramum tells us where to meet one of my favourite animals: bears! In December 2014 we spent Christmas in Romania. As the snow fell, this mother and son duo from Australia known as Exploramum and Explorason set out to explore the remote Carpathian Mountain area. 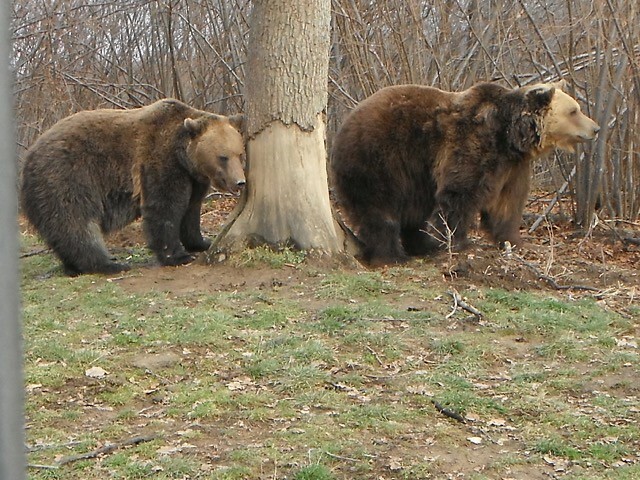 This can be found above the Transylvanian town of Zarnesti near Brasov and here is a rescue home for bears – The Libearty Bear Sanctuary. But what about locations that do not offer a green option? What if there is there is no eco-friendly accommodation or we are going to an area with little environmental awareness? Natalie from The Educational Tourist shares with us an easy way to make any family journey greener: eco-friendly transport options! Transportation is an important decision when choosing how to be green on a trip. Trains are a very green choice. From production to fuel, the average train will have a lower carbon footprint than other vehicles you might rent and train design and technology is always moving forward. We love to ride the trains in Europe. They are really family friendly. Not only do you have plenty of room to spread out, but you can walk around, stretch your legs or visit the restroom. Some trains have a snack car, too! Trade seats within your traveling party so everyone has a chance to visit and enjoy the lovely countryside without worrying about parking or reading the signs. Tray tables are wonderful for writing in journals or using electronics. Take the train and feel really good about your carbon footprint when you travel!! Do you want to make your family vacation kinder on the environment? 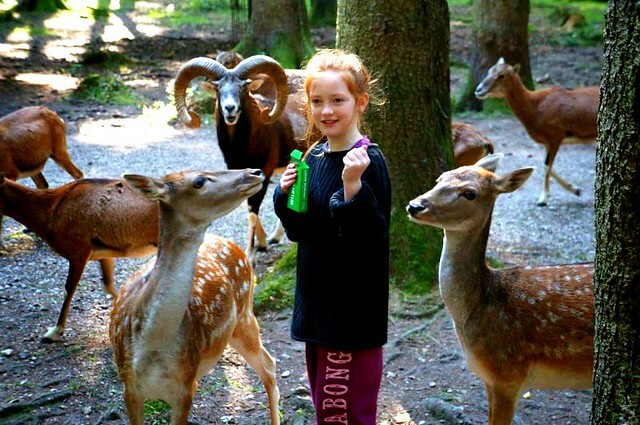 In this article we share some eco-friendly resort and activities you and your kids will love! I believe we put across a pretty strong point about how easy it is to make our family vacations greener! if you want to get more tips and tricks on how to make family travel greener, you can also check my post on the topic here. Do YOU have any tips or ideas to add? I’d love if you could let us know in the comments.